Habit Changer is a system that helps make you more aware and guides you through change. It gives you experiences - your choice of email, web, or text - that lead you through the skills you need to solve the issues you face. Feeding Your Kids is a 42-day program shows you how to make small changes every day to get your children to choose healthier foods on their own, gaining healthy eating habits that last a lifetime. 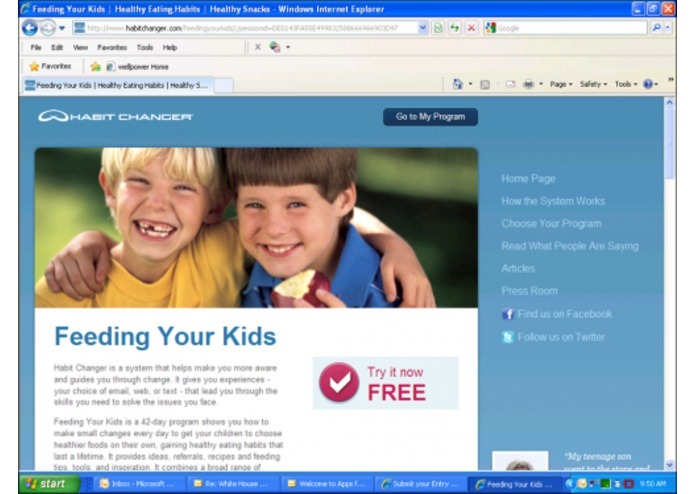 It provides ideas, referrals, recipes and feeding tips, tools, and inspiration. It combines a broad range of research and the personal recommendations of parents who have struggled with the same issues and found answers that worked. In partnership with the Clinton Global Initiative, this program is free to all parents.